Thea Stilton and the dragons code! Thea Stilton and the Dragons Code is a narrative written by Thea Stilton. Thea Stilton works at The Rodent’s Gazette, the newspaper run by Geronimo Stilton. She got invited to teach at Prestigious Mouseford Academy. When she arrived, she met 5 students that she found amazing. When they realised that one student went missing, they had to solve the mystery. I enjoyed this book because it was interesting to read and the book was so descriptive which made the book better. This book is full of mysteries which is the reason why I liked the book. The storyline is exciting and grabbing. If you start to read, you would love to continue reading, for you can know what happens. The characters that are in the story are Thea, Nicky, Colette, Pamela, Paulina and Violet. Thea Stilton is Geronimo Stilton’s sister, and she loves to travel and having adventures. Nicky loves nature and comes from Australia. Colette is always energetic and her favourite colour is pink. Pamela comes from Tanzania and wants to become a car mechanic. Paulina wants to become a scientist and she is shy sometimes. Violet is my favourite character and she loves to read books. She comes from China. To me, I think that Geronimo Stilton and Thea Stilton write books to enjoy and doesn’t have a moral but sometimes some books are enjoyable and have a moral. I recommend this book to 7 and up and to children that like mysteries. THEA STILTON AND THE MYSTERY IN PARIS! 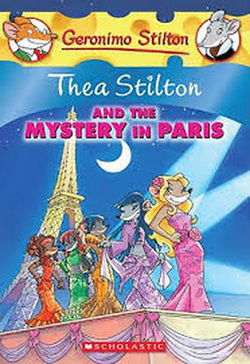 Thea Stilton and the Mystery in Paris is a narrative written by Thea Stilton. Colette invites her best friends to come with her to her home, Paris, her friends were so excited to come. While they were in Paris, Colette’s fashion-designer Julie, her fashion clothing was STOLEN! Will the 5 mice catch the thief before the fashion show? To know what happened read the book! I thoroughly enjoyed reading this book because it was so interesting to know what will happen and the descriptive adjectives, for example “Nervously Julie took her place behind the microphone”. This story grabbed me allot, I couldn’t stop reading! It was an easy book to read and most of all, what I loved was the storyline! The characters that are in the story are Colette, Nicky, Violet, Paulina, Pamela and Julie. Colette comes from France and she has lots of wonderful ideas. She wants to become a fashion writer. Nicky comes from Australia and she is always in a good mood, only if she is outside. She loves nature. Violet comes from China and loves books as well, she is so clever. Paulina is from Peru and she loves to travel and meet new people around the world. Pamela comes from Tanzania and she can’t stand arguments. Julie is Colette’s cousin and she is so friendly. I recommend this story to 7 and up and children that love interesting and entertaining books. 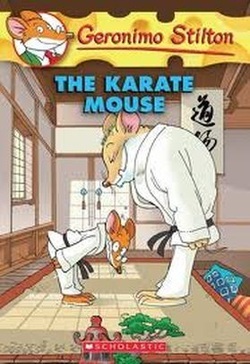 The Karate Mouse is written by Geronimo Stilton Geronimo is a book mouse that loves to read and he doesn’t like to do sport but his friends Bruce Hyena and Short Tao entered in him in a KARATE WORLD CHAMPIONSHIP. Geronimo didn’t know what to do, which made him worried, he was nervous, and he was concerned. To know what happened read the book. I enjoyed this book because it was entertaining and grabbed me like the other books. All the descriptions are just brilliant and the story describes the emotions very well. I love how the author made the characters funny and interesting. Like the other books, I loved when something goes wrong he says ‘HOLLY CHEESE’, it was hilarious. The characters that we meet in the story are Geronimo, Bruce Hyena and Shorty Tao. Geronimo is the main character, and is a funny, entertaining character. He is a book mouse and runs a newspaper at Mouse Island. Bruce Hyena is a friend of Geronimo and entered him in the competition with his cousin, even though he is a friendly mouse. Short Tao is a cousin to Bruce Hyena and was very kind to Geronimo. She was an active mouse not like Geronimo. I recommend this story to seven years old and up, and children that like hilarious, funny stories. 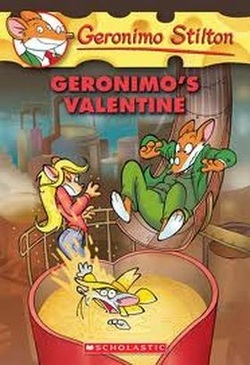 Geronimo’s Valentine is a narrative written by Geronimo Stilton. Geronimo runs a newspaper at Mouse Island, The Rodent’s Gazette. As well, he is a cheesy mouse and he loves Valentine’s Day and today is Valentine’s Day, and his date is with Petunia Pretty Paws, though there was a problem, his friend, Hercule Poirat called and said ‘I need your help solving a CHEESECAKE MYSTERY!’ Geronimo didn't know what to do, He had Hercule to help, as well Petunia on his date. Read the book to find out what Geronimo did and what happened! I enjoyed this book because it was hilarious and grabbed me allot and it was a wonderful time reading it with all the descriptive adjectives out loud. As well I love how when something goes wrong he says ‘Holly Cheese’. The main thing is when the author makes the adjectives stand out, For example ‘WHO DID THAT?’. Altogether it was the character. The characters that we meet through the story are Geronimo, Hercule, Petunia and Ms. Colorsnout. Geronimo is the main characters and he is so romantic, that’s why he loves Valentine’s Day. Hercule, a friend of Geronimo, he is a friendly mouse and is very helpful. Another character is Petunia, which is so beautiful, so charming, and so delightful, which Geronimo mentioned in the story. And at last Ms.Colorsnout, a kind lady who needed some help on the Cheesecake Mystery. I recommend this book to 7 and up and children that like funny and entertaining books. Nancy Drew and the Haunted Doll House is a narrative written by Stefan Petrucha. Nancy Drew and her friends live in River Heights, and the story is set during the time that the town is celebrating Nostalgia week. During this occasion, people dress up while pretending that it is the 1930s. However, Nancy starts to recognise crimes from Emma Blavatsky in her old fashion doll house. Nancy gets shocked when she finds out that there is a version of........... To find out read the book! I enjoyed this book because it was interesting for me and it was so fascinating when she finds mysterious things in the Doll House, which is that the dolls MOVE and especially how what happens in the Doll House, happens in real life. What also made it interesting was the fact that they were celebrating Nostalgia week and dressed up like it was the 1930s that was weird to me. 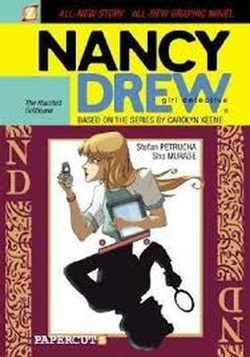 Nancy Drew is the main character in the story. She is a girl that loves to research about mysterious things and is always suspicious. Her friends didn't believe her in the beginning, but that didn't stop her from investigating. George is one of Nancy’s friends, a girl, who loves technology and is always found on her laptop or phone. When she realised that Nancy was saying the truth she helped her and they found things together about Emma Blavatsky. Emma is another character in the story and she owns the Doll House. Bess is another friend of Nancy’s that helps her out. She is a pretty, nice friend. Emma is the evil character that owns the haunted doll house as I mentioned. She is wicked and worried about the chance that Nancy might find out something about the Doll House. I recommend this story to children that are seven years and over, especially for those who like mystery and horror. Nancy Drew Writ in Stone is a narrative written by Stefan Petrucha. Nancy Drew often babysits a little boy, Owen Zucker, the son of Ellen who is Nancy’s friend. An archaeologist, David Severe, found a stone which proves that the Chinese found America before Christopher Columbus. He was going to show it to the world, but first, he was going to stop at the museum in River Heights. The community gathered to see the great discovery, but when David opened the case where the rock was, it was empty. Chaos erupted, and among all of this, Owen disappeared, he was missing. Read the book to find out what happened to him and the rock! I enjoyed this book because it was interesting, and I really like Nancy Drew’s character. In this book we meet new characters, David Severe, the archaeologist whose stone was stolen, Mr Brimstrom, the museum director, Mr Wentley, he works in the museum and suspect number one, Owen, the cheeky naughty boy, and Ellen, Owen’s mother. As always, Nancy Drew jumps at the chance to investigate; curious which also makes us curious, eager to know what happens in this mystery. I especially like reading this book because it has pictures which clearly show their expression of fear, and excitement. I like reading it out loud, especially all the onomatopoeia. Writ in Stone has not just one criminal, but too criminals, which is unexpected, adding more excitement to the complicated problem. Nancy Drew gets help with her best friends George, Bess, Ned and another archaeologist. They all help and lend a hand in solving the crime. Even the whole community get together to search for Owen. Nancy Drew and the Demon of River Heights is written by Stephan Petrucha. Nancy Drew and her friends, Bess and George, are set in the town River Heights. There were two filmmakers and they were with Nancy and her friends. Bess invited them to meet them at a coffee shop but they didn’t come! They went looking for them and they knew Mr. Angelys had something to do with it. Nancy and her friends started to get suspicious if a............! To know what happened read the book. I enjoyed this book because the wonderful onomatopoeia, great cliff hangers, mysterious illustrations, and the story. The author had great onomatopoeia such as RARHHHH when the monster was chasing Nancy. Usually in this story, there would be a cliff hanger at the end of a chapter. It makes the reader want to read more and get interested. The illustration makes the reader visualise the mysterious events. Most of all, the story grabbed me and made me entertained the whole time. 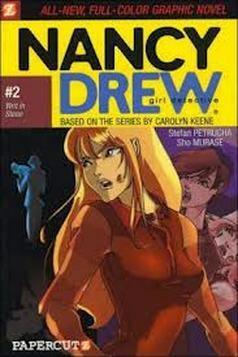 The main character is Nancy Drew she is girl detective and researches for clues to find the filmmakers. George is a friend of Nancy and helps Nancy to find clues usually with technology. Bess is another friend of Nancy and helps her as well and mostly she got frightened. Ben and Quentin are the filmmakers and they got missing so Nancy Drew and her friends went searching. Mr. Angely is the father of Todd they were working together. 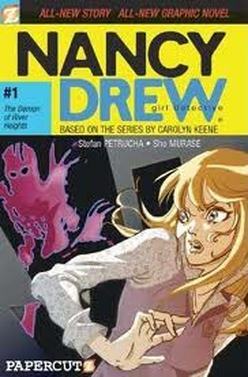 Nancy Drew and the Demon of River Heights, does not have a message to it, though it is written to entertain people and to have fun. I recommend this book to children six and up and children that like mysterious and easy books to read. My favourite book is Nancy Drew and I would love to continue reading the series. As well, I love Geronimo Stilton and Thea Stilton.